Great for 24 Hour Zulu Time ( UTC, GMT ) and Local Time! Track Any Two Time Zones Easily! The CK-2 conveniently and reliably displays time in any two time zones! Its highly readable, unique, and attractive LED illuminated display shows separate Hours (in two time zones), Minutes, and Seconds. The CK-2 is essentially two clocks which are set up for synchronous operation. Both clocks track each other perfectly, second after second. Let the CK-2 take the guesswork and confusion out of tracking any two time zones. It makes national and international timekeeping easy and effortless! Dual six digit LED readout displays show seconds for precision timekeeping capability rarely found on other LED display clocks. Easily read at a glance Local and UTC Hours, Minutes, and Seconds. Large and bright 0.56 inch red LED displays are easily readable in any lighting condition- no more squinting! Easily settable to a time standard. A "hold" button is provided to stop the seconds count. Two front panels available: UTC / Local or Plain Panel. Please specify when ordering. 9 volt battery back up keeps accurate time during power interruptions. Never miss a second! Use the CK-2 Dual Time Zone Clock to display UTC / Local time or any two time zones - a very unique desk clock! In use throughout the US Military & Ham Radio! In production since 1995, the CK-2 is designed and built for years of dependable and reliable timekeeping service. Plain Panel is blank to indicate any two time zones. Please Specify UTC Panel or Plain Panel when ordering. 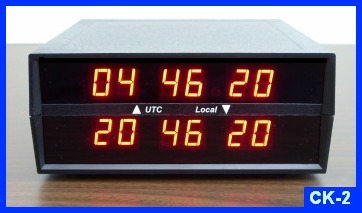 CK-26 Time Zone Desk Clock : UTC and local time dual display desk clock. CK-2000 Dual Time Zone Wall Clock : Displays UTC hours and local time at a glance!